This week's challenge over at Glitternsparkle blog is summer holidays. 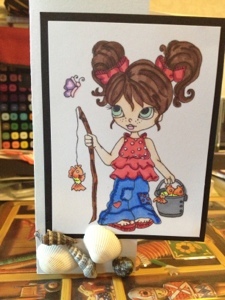 My image is called Molly- fishing from Lacy Sunshine. I coloured her in with my spectrum noir pens. After colouring in the image I mounted it onto black card then I mounted it onto a6 centura pearl card. Then I added some shells onto the card. Fresh brewed designs are offering 3 images from their store. Qkr stampede are offering 5 images from the store. Lacy Sunshine $20 gift certificate. Di's digi downloads $10 gift certificate. Beautiful card and love the cute image. Lovely card, pretty image, love the shells. Lovely card, Sam - great colouring and love the addition of the shells. You've coloured her so beautifully, Sam. I really like those shells too!